The Trump administration's sanctions have cut Iran's oil exports more quickly than expected, but the White House is still far from zeroing out its shipments. Iranian oil exports dropped by about 800,000 barrels per day from their 2018 peak, but Iran was still selling roughly 1.7 million to 1.9 million bpd in September. China and India, the two biggest buyers of Iranian crude, are widely expected to keep purchasing barrels from Iran. The Trump administration has cut down Iran's oil exports more quickly than many expected, but just days before a White House deadline, it is still a long way from achieving its stated goal of zeroing out Iranian oil sales. Iran's oil exports have fallen by about a third in the five months through September. They tumbled by about 800,000 barrels per day since President Donald Trump announced in May that he was abandoning a nuclear accord with Iran and restoring wide-ranging sanctions on its economy. Still, Iran was selling roughly 1.7 million to 1.9 million bpd of crude oil and condensate, a super light form of oil, in September, according to estimates by investment banks, tanker-tracking firms and the International Energy Agency. That's down from a 2018 peak of 2.7 million bpd in June, according to ClipperData. In the first six months of the year, Iran was averaging 2.4 million bpd in shipments, S&P Global Platts Analytics estimates. Some of Iran's biggest customers, including China and India, are expected to keep buying its barrels. The Trump administration has also indicated it will allow some countries to continue importing limited quantities of Iranian oil, but officials haven't disclosed which nations will receive waivers. Along with China and India, countries like Turkey, Italy, Spain, Greece and Japan have kept purchasing Iran's crude. But analysts widely expect the losses to balloon to between 1 million and 1.5 million bpd by the end of the year. "Iranian crude and condensate exports look set to finish October around a similar level to September, although we expect volumes to drop off next month as sanctions kick in and buyers dissipate," said Matt Smith, director of commodity research at ClipperData, a firm that tracks tanker traffic. Petro-Logistics, another tanker-tracking firm, says Iran probably lost more than 100,000 barrels per day in October. Trump is restoring sanctions first implemented by the Obama administration to isolate Iran from global markets over its alleged pursuit of nuclear weapons. Those sanctions, backed by the European Union and the United Nations, forced Iran to the negotiating table, where it agreed to limits on its nuclear program in exchange for sanctions relief. After taking office, Trump failed to convince European allies to take a tougher stance against Iran and renegotiate the 2015 Iran nuclear deal. Instead, he pulled the United States out of the agreement, restored sanctions on Iran and threatened to lock foreign firms out of the U.S. market if they do business with Iran. Trump gave countries six months to wind down their purchases of Iranian crude. State Department officials later told foreign nations they expected oil buyers to cut their purchases to zero by Nov. 4, surprising the market and sending oil prices higher. That hard line prompted many countries to scale back purchases quickly, said Richard Nephew, lead sanctions expert for the U.S. delegation that negotiated the Iran nuclear deal. Nephew had originally expected the sanctions to shrink Iran's exports by about 600,000 bpd. Nephew says many of the "easy barrels" have come off the market, and the administration must now convince holdout countries to stop importing Iran's oil over the next six months in time for the next review. "May is going to be harder — a lot, lot harder, and what they do between now and then is going to decide if this is at all successful." In recent years, Iran has sold about 3 to 4 percent of the oil the world consumes each day. 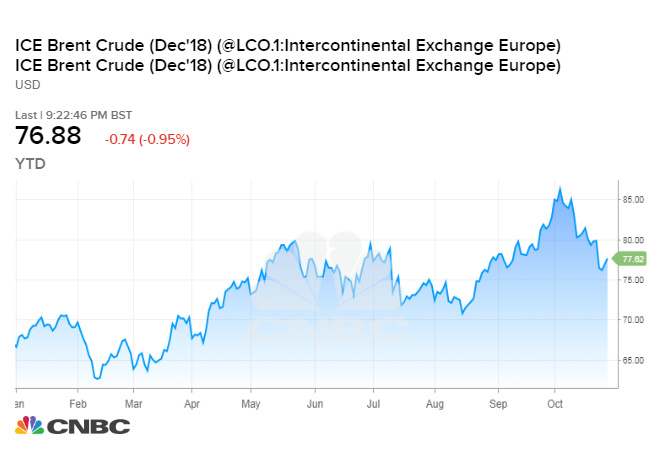 The threat of losing much of that supply helped push the price of Brent crude to nearly four-year highs above $86 a barrel earlier this month. However, prices have plunged nearly $11 a barrel since then, knocked lower by a sell-off in risk assets, concerns about slowing global growth, and confidence that OPEC, Russia and the United States will be able to keep the market supplied with crude. Brent has now settled back into the $70-$80 per barrel range, where it has traded most of the year. "That might even spur the administration, encourage the U.S. to take a tougher stance on Iran," Vandana Hari, founder and CEO of Vanda Insights, told CNBC on Monday. "So I think there might be another spike left in crude still. It's not all downhill from here." To prevent price spikes, the Obama administration allowed foreign companies to continue buying Iranian crude so long as their country reduced its overall imports by 20 percent every 180 days. The Trump administration has been less transparent about how it will dole out sanctions waivers, leaving the market uncertain about how rapidly supply will drop after Nov. 4. "So far no single country has actually been promised, let alone been given waivers, so I think that is still a wild card in the market," Hari said. It also remains to be seen which countries will skirt the sanctions, which have little impact on firms that don't do much business in the United States. China, Iran's biggest customer, was still importing just under 450,000 bpd from Iran in September. However, the country's two biggest refiners are not loading Iranian barrels for November because the Trump administration has not given them waivers yet, Reuters reported last week. India imported nearly 600,000 bpd in September, though shipments have since fallen. The government is reportedly allowing state refiners to use Iranian tankers and insurers to import Iranian crude. India is also seeking sanctions waivers. "The importance of China and India as destinations for Iranian crude has increased significantly over the past six months as many European and Asian OECD countries have either ceased or greatly reduced their requirements," said Petro-Logistics CEO Daniel Gerber, referring to a group of developed nations. "While Chinese and Indian purchases of Iranian crude in April represented slightly over half of all Iranian crude exports, this is likely to reach three-quarters in October," he said.